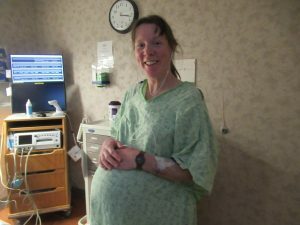 This birthing story is long because there are many different points that I’m hoping some can find encouragement from in our varied experiences. This was my third birth, and my first Hypnobabies, my first two had epidurals. Because I am “advanced maternal age” my OB wanted to induce me at 40 weeks according to the ultrasound dating. I easily convinced him to put it off by over a week (hilariously, he tried to schedule it for Feb 29th!) because I had been charting when we got pregnant and KNEW that date was off by a week. As a compromise I agreed to a fetal-non-stress test a few days later (40+4 according to ultrasound, 39 + 4 according to charting). As I lay on the gurney with the monitors around me, listening to the baby’s heartbeat, the nurse walked over and said, “those are c–s. Can’t you feel them?” Well, I had been having crazy Braxton-Hicks for weeks and it just felt like more of the same. But otherwise, the monitors said baby was happy and healthy. I went to work, and through the day the pressure waves (Hypnobabies word for contractions) got more frequent- consistently every 4-6 minutes by the late afternoon, but could talk, walk and concentrate through them (indeed I’m a professor and conducted a thesis defense!). I called my hubs and organized a friend to pick up #2 from daycare and walked over to OB triage at the university hospital where I work. that I was still only 1 cm dilated and 3 cm thick so they sent me home. I had dinner, read the #1 and #2 stories and put them to bed while hubs went to a work meeting for an hour (did I mention this is my third birth?!?!). I snuggled up in bed with my Hypnobabies tracks (Birthing time begins & Easy first stage, which is the main birthing day track) and even got a couple of hours sleep. Around midnight, the pressure waves were strong enough to keep me awake, but I just mellowed out to Deepening (Hypnobabies track for deepening level of hypnosis) which I swear was the first time I “heard” the whole track. Shortly after 1 am, I woke up hubs sent him across the street to get the neighbor as a thought I didn’t want to be doing the car ride any farther along in my birthing time (Hypnobabies word for labor). My visit to the toilet had the first bloody show. We got to the hospital at 2 am, and the walk to OB triage had me stopping every few minutes to put my head against the wall and finger drop through a wave. After 20 minutes on the monitor and a cervical check (5 cm), the triage midwife took me off the monitor to let me move about as needed. Both the triage nurse and midwife didn’t need any coaching on what “I’m using Hypnobabies” meant except the question “are they surges or waves for you? I get them mixed up”. Both were very respectful and waited for my waves to end. I sat on my big green ball for a while I listened to my tracks I visualized myself as a big orange tube of toothpaste getting rolled down from the top with each pressure wave. I also really focused on the “Open” idea. Now I’m not going to say that this was discomfort free, but I was, however, very chill and could just go with the flow and relax into each pressure wave. I went out of the room at some point to pee (more bloody show) and had a pressure wave on the toilet. And on the way back to my room the midwife asked me if I was OK. “Oh, I just had a wave on the toilet, but I’m fine. But things ARE getting more intense” But I think because I was so chill, they really didn’t realize how intense I meant, or how close I was. The baby was born probably 30 minutes later. Instead of returning to the ball, I started just standing and putting my head against the wall with each pressure wave. I started (intentionally) vocalizing each wave with a low hum and I had to bear down with each wave at its peak (Silly me! That’s not transformation! (Hypnobabies word for transition) That’s pushing! But somehow I didn’t clue in how far I was at the time). This is the BOP (Bubble of Peace) part. But I’m including it because I want others to feel OK with different variations of experiences. Not being all zenned out and discomfort free should not be thought of as failure. I’m not sure I was ever in true deep hypnosis during my birthing time (certainly not as deep as I sometimes got listening to “deepening”), but I definitely was relaxed, confident, and able to just finger drop and surf my waves for most of it except that last few minutes. I deem this whole thing as a success for me. The anesthetist did show up and annoyingly started asking me questions through my waves. I refused to answer and hubs stepped up to the plate here and asked her to wait and answered the questions he could for me. The truth of the matter is that I was way too far advanced for that epidural; I was well past transformation and involuntarily pushing. I’m pretty sure the midwife sent her away when she went out of the room to get something from her cart. 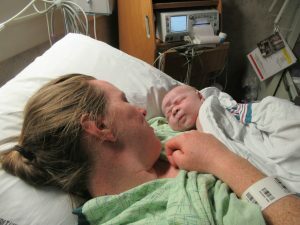 After my water broke I could feel the baby’s head deep in my pelvis. I had been so chill and relaxed that I got through the bulk of my birthing time (Hypnobabies word for labor) that it all had gone by relatively easily. The rest was a bit of a blur and honestly was probably only about 10-15 minutes in duration. After my water broke, the pressure waves got very intense. I really relied on the Relax (Hypnobabies cue to deepen hypnosis), Release (cue to instantly enter hypnosis) and Peace (Hypnobabies cue for instant physical comfort) cues here. I think my bellowing (yes, it is OK to bellow), finally convinced the triage midwife it was business time. While I had Hypnobabies in my earbuds the whole time, there was no time to change to the pushing track, and at some point, they wanted a cervical check, but my personal check while standing told me the baby crowning. I thought I was going to have that baby standing up. Eventually, I got up on the bed on the next momentarily break between waves and just started pushing, during a wave, between a wave, it didn’t matter: If I was going to do this, I was going to do this NOW. My body was ready. I swear, it was less than 30 seconds of additional pushing and WOOSH, my big fat baby boy was placed on my chest. 9 lbs 15 oz and a 98th percentile head. Birthing hips indeed! All in the triage room which was the size of a tin can. There is a picture attached of me up and smiling and moving around at 3:15 am and that was still some time before things got really intense. The baby was born at 4:07 am. Even though I was “in my birthing time” all day, this is evidence that things can change very quickly! I should also mention that this birth was my biggest baby, but the least tearing (1st degree) and the fastest physical recovery. 1) Because everything happened so fast and it was my first time not having an epidural, I’d discuss with my provider and possibly ask for more time to let the placenta detach and birth on its own. I used my peace cue quite a bit for that part. 2) I wore my bra to hold my phone to play my tracks. I should have chosen a bra with straps that could be removed or some sort of phone armband holder. After the baby was born I couldn’t get the bra completely off until after the IV and post-birth Pitocin drip was detached! 3) If I were to do this again, knowing my body and how short in duration the challenging part is for me, I’d choose a birthing center or a home birth, not necessarily because of the birth experience, but because of the revolving door of my hospital recovery room over the next two days. I’d rather have one midwife do it all.